Microchips are digital components, such as transistors, LEDs, diodes, and microcontrollers. The recipe for the Microchip depends on which Recipe Mode you have specified in the config file of Power Advantage. 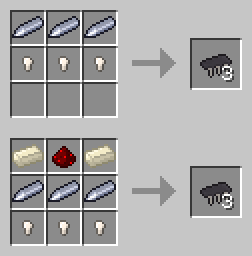 The upper recipe is what you will see in the NORMAL recipe mode. The lower recipe is for the TECH_PROGRESSION recipe mode. You cannot craft microchips in the APOCALYPTIC recipe mode, but can salvage them by smashing a Control Circuit with a crack hammer. The nuggets in the recipe can be either copper, tin, or gold nuggets. Microchips are used primarily to make Control Circuits, though some machine recipes use microchips as well.